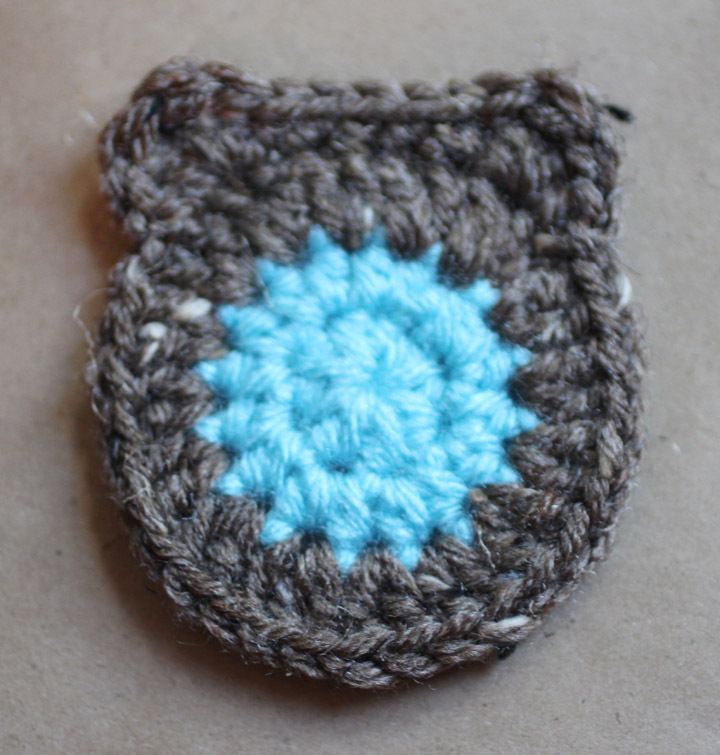 I posted this pattern on my friend Kara’s crochet blog, Petals to Picots, back in August in honor of her Granny Month. 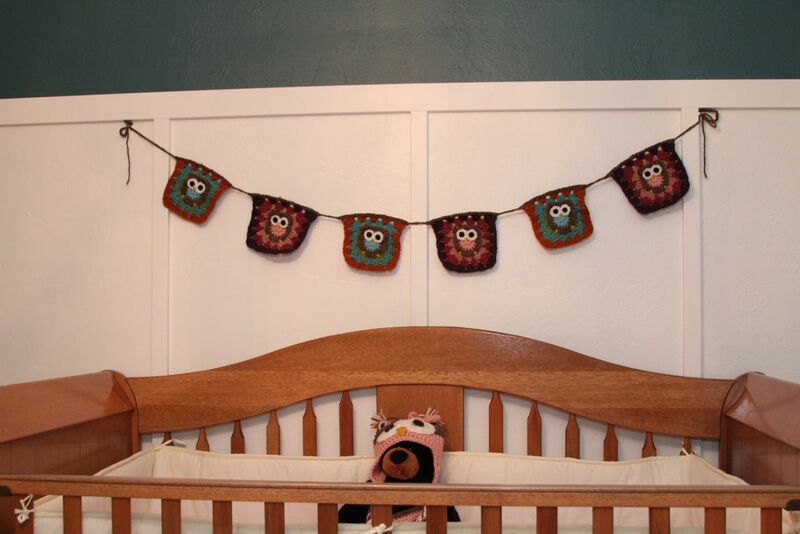 But I thought I would share it with you again and show you how the owl squares are being used! 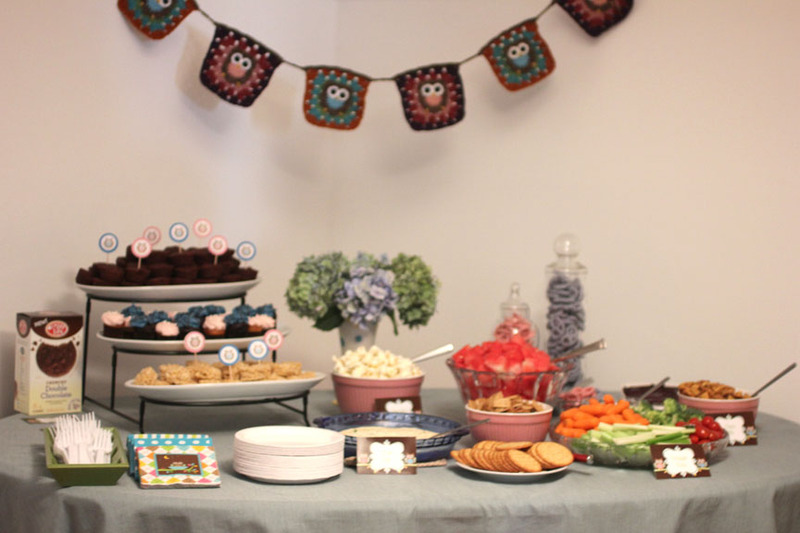 I made them into an owl bunting for my friend Shannon’s owl-themed gender reveal party! 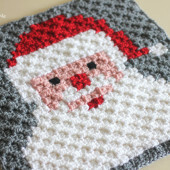 Of course I would love to make an afghan with this square pattern, but I need more time and patience to take on that type of project right now 🙂 If you are interested in making a blanket with these squares and want to alternate between the owl granny square and a basic granny square, you can follow a basic granny square pattern like THIS ONE and your squares will be the same size. Click here for how to make a Magic Ring. Start by making your owl. This pattern would also make a great appliqué! SC and chain 3, skip one, SC and chain 3, skip one, SC and chain 3, all the way around. In the end you will end up with 8 places where you have connected with SC’s and 8 chain 3 spaces. slip stitch to join to the bottom of the first chain 3. Chain 3 – 2 DC – Chain 1 – 3 DC all in same space, Chain 1, 3 DC in next space, Chain 1, *3 DC – Chain 1 – 3 DC all in same space, Chain 1, 3 DC in next space, Chain 1, *Around, slip stitch to join to the top of the first chain 3, fasten off. Chain 3 – 2 DC – Chain 1 – 3 DC all in same space, Chain 1, 3 DC in next space, Chain 1, 3 DC in next space, *3 DC – Chain 1 – 3 DC all in same space, Chain 1, 3 DC in next space, Chain 1, 3 DC in next space, *around, slip stitch to join to the top of the first chain 3, fasten off. Chain 3 – 2 DC – Chain 1 – 3 DC all in same space, Chain 1, 3 DC in next space, Chain 1, 3 DC in next space, Chain 1, 3 DC in next space,* 3 DC in next space – Chain 1 – 3 DC all in same space, Chain 1, 3 DC in next space, Chain 1, 3 DC in next space, Chain 1, 3 DC in next space, *Around, slip stitch to join to the top of the first chain 3, fasten off, weave in all ends. Now you can add the embellishments to the owl. Magic Ring, Chain 1, 8HDC in magic ring, join to first HDC, fasten off leaving a long tail to sew on. Sew on no larger than 1/2″ black buttons in the middle for eyes. You can download a PDF of this pattern HERE. Love the purple and pinkish one! 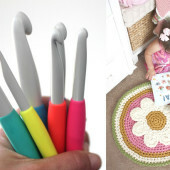 What a super cute crochet pattern and some terrific examples of how to use it in creative ways! Nice share! These are so adorable! I will definitely be trying soon. Thank you so much for sharing!! thank you!!! 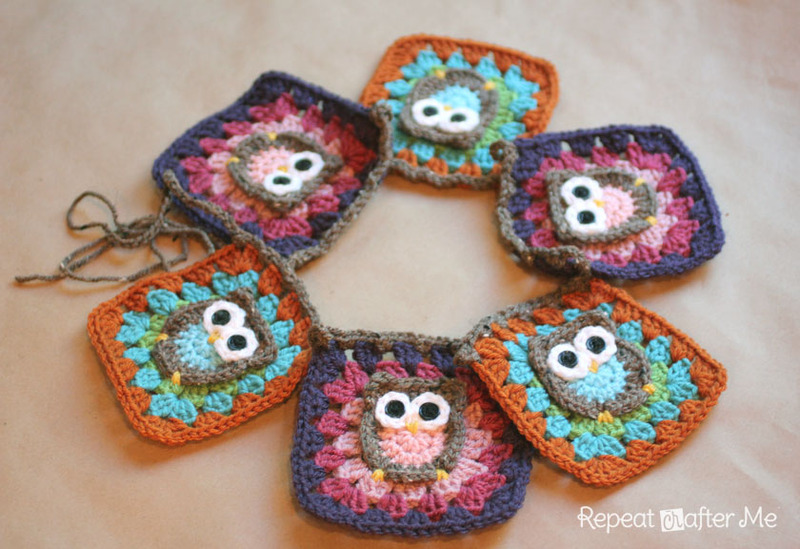 these granny owls are so beautiful!!! Sooooooo cute! Thank you very much for sharing this. I really love this!! I used this along with a regular granny square to make my friend a blanket for her owl themes baby shower! It turned out great!! wow, I just found my new favorite blog. I L O V E Y O U R B L O G! You are incredibly creative, and make the nicest things. Love your recipes, they are really good! I've just crocheted one of the great owl hats you've made. Oh so cute! 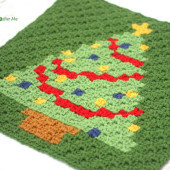 Thanks so much for taking the time to publish this adorable pattern. I am new to blogging, so I hope I linked everything properly to your blog in my post, because I just had to share this! Good grief this is cute! I saw you got it on Craft Gawker! I've managed to get one thing accepted there – they are CRAZY picky! Such a great pattern, Sarah. Thanks so much for sharing at Hookin On Hump Day! Oh wow! So beautiful! I just NEED to make these. They would make great gifts 🙂 Thanks for sharing! I love anything with owls…so cute!! Hope you will join us again this weekend ? Wanted to let you know, I added this post to things I want to make and also downloaded your button!! Thank you for being so inspiring! I love these squares Sarah. I am about to set off on a couple of months of back and forth travelling moving from one country to the other side of the next and I have decided I am going to spend my sitting time making these and have already started a travelling box collecting wools etc. Thanks for this inspiring idea and hopefully I will eventually show you the result. I wonder if there's an opportunity for me to translate this wonderful pattern to Swedish and borrow images? Of course I link to your blog where the original pattern is, and do you have anything else to say about the pattern, I write naturally with it. 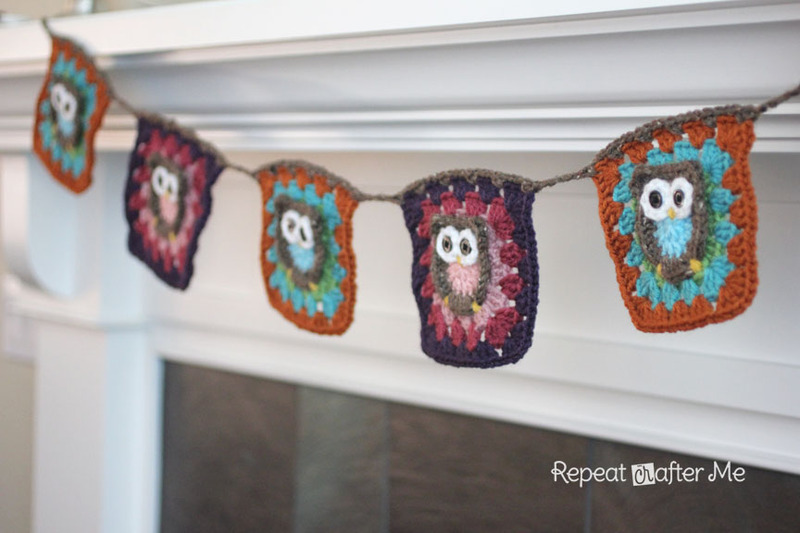 I love this….please tell me how you crocheted them into a banner. These are the cutest squares I've ever seen! About how big do they end up? I would like for them to be 8 in. so I can donate them to Knit-A-Square. If they are not 8 inches, do you have a suggestion on how to make them larger? I made the orange owl squares into a scarf for my daughter, five squares per side with a plain sc/dc band across the back of the neck. She is in love with it, it's so cute. You'd need to add a row or two to bring it up to 8 inches for KAS I think. The granny square is so beautiful. Thank you for the pattern. Yes, I would like a VIDEO, too! Thanks for sharing this pattern. 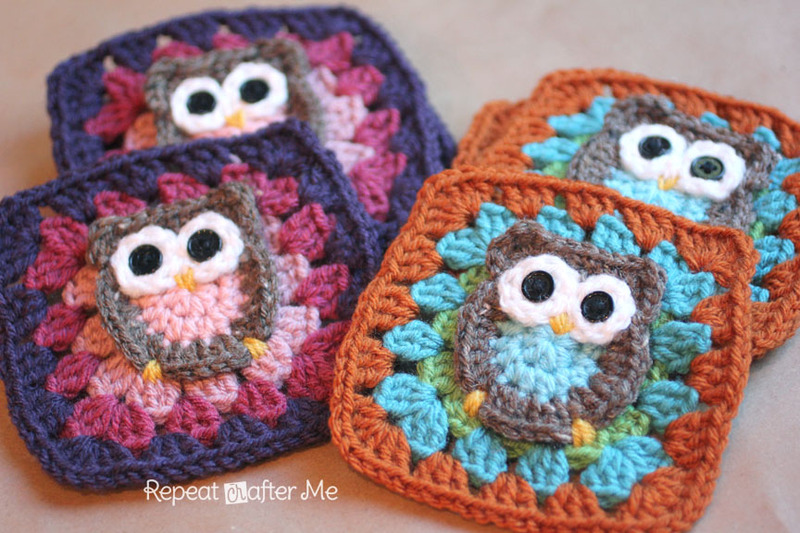 I am making a baby blanket and I an thinking of adding these owls as applique around the blanket. Hi Sarah, I LOVE LOVE LOVE these. I am a Beginner crocheter… I mean a PRE-Beginner! 🙂 I go to a class for one hour one time a week. The instructor goes to each person and helps them out so I feel it's a slooooooooowwww process and the class is only 8 weeks long. So, my question is do you think these are good for a Beginner? Or more for an Intermediate crocheter? I would like to make them as potholders. Thanks! These are definitely not a project for a beginner. I would start with a scarf and try different stitches. Thanks for sharing this pattern, Really I love these. LOve LOve LOve this!!! But I'm fairly new and I have a hard time understanding written patterns. Would it be possible to have a tutorial made?? Thanks for any consideration!! and Thank you for share your beautiful work !!! awesome tutorial!!! great instructions, thanks a lot!! This is great! I saw this on Facebook and clicked here. I saw a craft here I really liked and thought I had bookmarked your page but I didn't and I forgot the title of your blog and voila! The link led me here! I Liked your page on Facebook and will be sure to bookmark this page 🙂 I'm also going to share this craft on our CafeMom group Holiday and Party Crafts with the link back to you. Thanks so much!!! I love this. It's so cute! Thanks for this tutorial. It's so lovely ! Am I allowed to translate it to French to share it with members of my needlework club ? Or maybe there's an "official" French version already existing somewhere ? Thanks so much for a lovely owl-pattern. I have included the owl in a grannysquare-blanket I made for a little boy's first birthday. Today I have presented it in the blog I and my best friend write. I sure will try some of your other chrochetpatterns in the future! Best regards from Nostet in Norway! I have a question for you. 🙂 I am making my mom an afghan and I was wondering how big these squares are when you finish them? Thank you for your time and this pattern, it's adorable! I just visited my local wool store in penrith, sydney and they have this pattern made into a large blanket in their window!!!! just thought you should knnow! thank you for your info! i've been having a hard time getting these squares to look right, even following the directions to the letter. i've ended up with 9 chain posts instead of 8, on the bac, and have to have made improvisational fixes. not fun. also, it seems as if a *chain* instruction is missing from the second color round instructions (before the *). that's fun to realize after finishing the round off. Thank you greatly for this pattern! We love owls in our home, and this is a favourite for my girls! These are gorgeous! I've pinned to come back to. I was thinking they could be made a bit bigger (same owl, just more around the outside), with a felt backing, and used for pot holders. What do you think? I reckon my 11 year old might get a kick out of making one or two for Christmas presents. Hello, will anyone consider to make a pattern tutorial out of this? (With Sarah's permission of course. I love Owls. 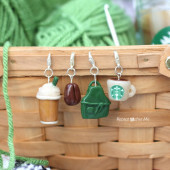 These crocheted ones are so cute. I want to make some of these. Super cute pattern!! Could anyone please tell me how to enlarge the owl? Thanks a lot! I was wondering if it would be okay if I link your post in my blog for creative ideas and translate it into german? could I use your pictures for that too? when it says in the next 5 does that mean all of these DC-TC-DC, SC in one stitch and repeat 5 times or DC in one stitch TC in one stitch etc? If I post this to my blog, I'll be sure to link back here! Hi! Really love the pattern but struggling with round 5 where you have to turn the owl over and work under the dc. How do you attach your new colour? Are you supposed to start with a dc or 3 chains? Please help! First of all, thank you for a wonderful pattern. Maybe a video?? Love these so much! Hi! Great pattern! It's so fun and different. I'm a new crocheter and I'm not the best at reading patterns. 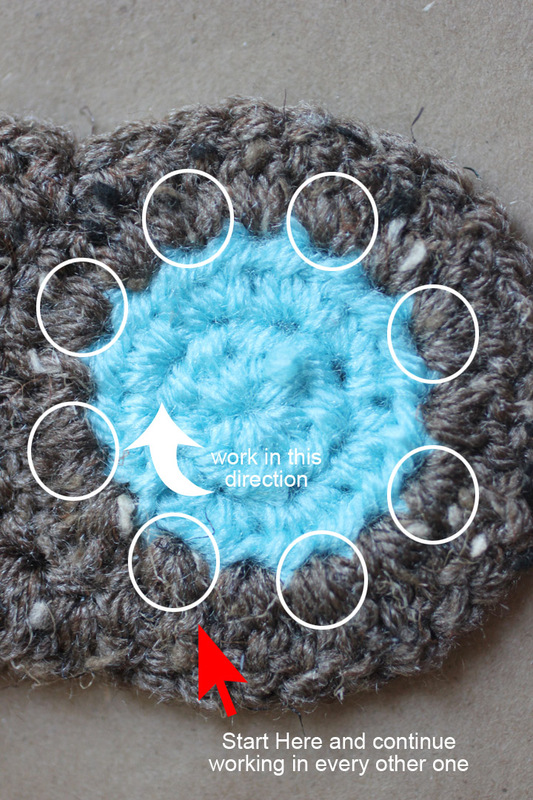 I suggest to anybody else new at crocheting who may be attempting this pattern to have the regular Granny Square mastered first. I tried to make the owl square before I learned the granny square and it kept coming out round. 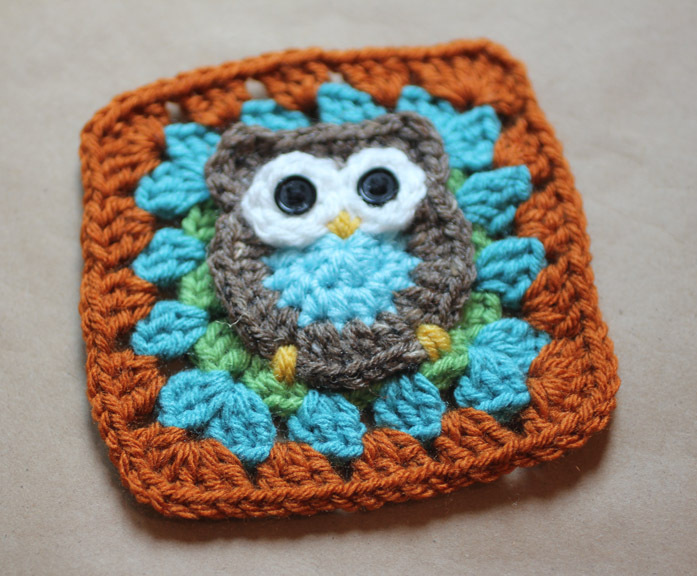 After I made the granny square and figured out how to math-it-out the owl square became square in my next attempt. Thanks again for sharing, they're truly wonderful! These might just be the cutest things I've ever seen! I love crochet, but something I try seem a bit old fashioned (not in a good way). I will give this a go, I'm thinking cushion maybe, and be sure to let you know if it turns out well. Love this. 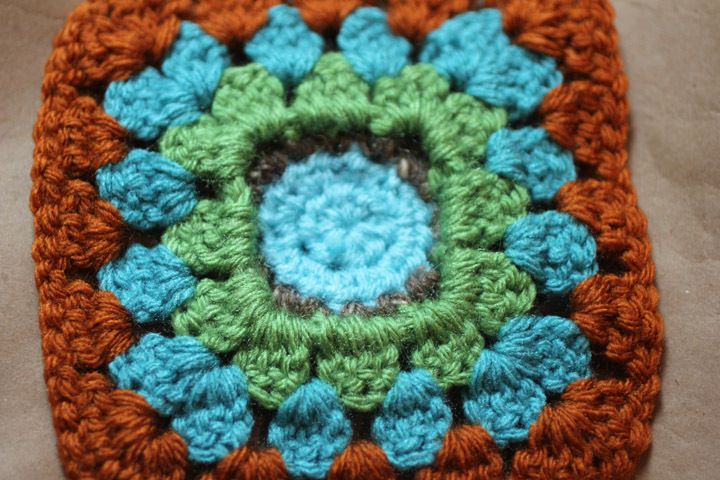 I've avoided granny squares but had to make this one – and now I've downloaded the pirate patterns – oh dear – added to my list of things to do as got couple of toys and a a cardigan to finish. This one was so quick it was like having a rest 🙂 Thank you so much for sharing your patterns. I saw this pattern and thought I would try this for a lap blanket for a nursing home in our church community. I will let you know what they thought. O loved tris pattern! Can you helo me with something? Why when you Starter with the square you need to do the sets of 3 chains clockwhise ? Thank you so much for this Owl Granny Square, I love it. I just made one and it's too cute, I think I'll make an afghan, pillow and who knows what else. Just a bit of advise for a beginner, practice a few granny squares before making your first one, I think this will help you. Thanks again! I love the colors that you used. Can you tell me what the name of the colors are? I had the same problem. 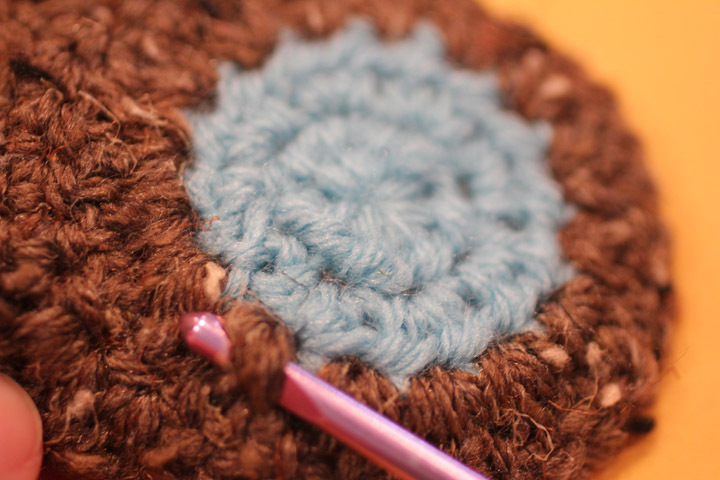 You have to move where you are going into the double crochet. Chain 3 should be behind the ear as that is where the corner will be. Sarah, thank you so much for sharing this pattern!! I just made my first owl over the weekend and can't wait to make a baby blanket with a mix of owl squares and granny squares. How do you attach the eyes? Do you crochet them separate and sew them on? Once again, if it's got owls then I shall LOVE it! Thank you for this sweet owl pattern. I want to make blanket for my new grand daughter due in November and I can't get the 'attaching' part right. Please, do you have a VIDEO link?? Thanks! I'm right in the middle of making a blanket for my new grandbaby and sure could use a VIDEO starting with the CHAIN 3s on the BACK of the OWK!!!! PLEASE?? HDC, in next stitch: DC – TC – DC, SC in next 5, in next stitch: DC – TC – DC, HDC in next, slip stitch to join – I did mine and realise the top as all ruffled as I'd read the pattern as being 5 stitches in the middle of DC-TC-DC-SC. When it should be first stitch is HDC-DC-TC-DC, then in the next 5 stitches do SC, then in 7th stitch do DC-TC-DC-HDC. Just in case anyone else read it wrong like me. Also I didn't understand how you wrote the first lot of double crochets in the 8 chain spaces. But I then figured out you do 2 lots of 3 double crochets for the corner with a chain space in between them,and then 3 double crochets in the next and then repeat that around 4 times. I am sure it's me unable to follow the pattern and not the pattern fault, only been crocheting since January. Love this pattern, will be making many more now I've worked out what I'm doing. 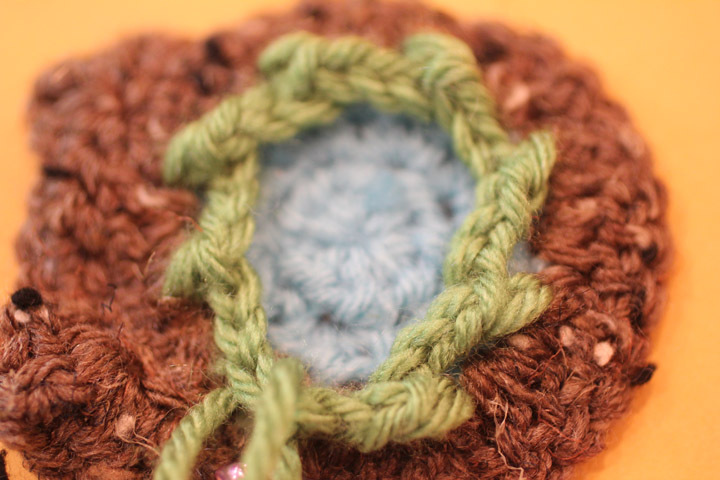 Thanks for sharing it, love Kat's blog too, just making her crochet roses hearts. need help My ears won't point! What I'm I doing wrong? Does Anyone happen to have a picture that they could post of the back of a finished owl granny square? I'm just wanting to see if the stitching to the embellishments is supposed to be visible or hidden. Thanks! WoW! This must have been a popular pattern! I had to to scroll down a mile before I got down to the end of your comment section for this one. Just wanted to say thx again for another lovely pattern. Again, my mind says "Coasters". I guess I like coasters or something. I know this, I like owls and coasters so I'm happy to see this pattern. Happy Crocheting! Hello, I would like to say "Thank you" for sharing your gorgeous owl pattern. This is exactly what I am looking for. It has been many years since I've crocheted an am Looking forward to being creative once again. My husband passed away just ten months ago, being along in a town we had recently retired to. I decided I surely needed to once again start a hobby I had truly loved. I have no doubt it will take a bit to recall all the stories. I have an adult daughter that loves owls an is crazy about them. I know when I finish and send this beautiful patterned owl in a large throw (that's what I'm hoping to make her) she will be over the moon. Not crocheting in such a long time I am at a loss for how much yarn I should order. I do plan to create the throw output purples as purple is her favorite color. I plan to use the owl squares and the granny squares as I'm wanting to make this quite large. My problem, I'm at a loss for how much yarn I will need along with what purples. I am hoping you can help me with just what I will need. As I wrote I will be ordering on line. being handicapped I can't get to the stores myself. My wonderful husband who was a retired Veteran did my shopping. I'm sorry for such a long post but I honestly didn't know of anyone I could ask for advice with this. I have bookmarked this page so I can find the instructions again an would be extremely grateful for any reply's with some helpful advise. I also haven't purchased yarn in forever, or as it seems. O:) any advice as to the name brand of a yarn that is good quality but isn't all that costly would be nice to know. I don't know if I am allowed to add my email address here for any reply's but I will list it and hope it will be okay. Please excuse my long post, I hope you or someone will be so kind and help with the amount of total yarn for the throw along with the colors needed. I thank you kindly for any and all in advance. I started an Owl Granny Square afghan in May after the second time A friend sent me this link. Today I got it for the third time so I decided to state my progress. I decided on making 55 squares with 5 different color squares behind the Owls. I also decided early on NOT to use buttons. 110 buttons just sounded too much. So I'm making a 6 prong starburst in the center of each white circle. Very Cute. I am about ro set up a blog. I know a lot of people ego would love to crochet this square. A lot of them have difficoulties with the english language… I wonder If I may translate this pattern to swedish and copy the pictures. I will link back ro this site. Have a Nice day! Does anyone make and sell these by chance? Love the pattern but having to pay 9.00 a month to print it off from Scribd is a bit much. Love your site but that is alot of money. Thank you so much for this pattern!! I have considered making grannies, but never really saw any that I *had* to make. Until now. I have so many ideas!! Love this, thank you so much for sharing! I’ve been looking for a project I could really dive into to ward off the cold weather blues, and this is so cute I have to try it. Your instructions are very well written, thanks again! OMG ! I just found out your website… thank you so much for this article 🙂 I think I’ll have lots of fun here…..
Love this little owl! Added 2 blocks to Lion Brand’s Heirloom Sampler Baby Afghan and love the finished project! Thank you! Cute! I love the color you used. Thank you for sharing pattern. No entiendo como en la página no me deja traducir al español, creo que algunas veces que he entrado si he podido, me podrían indicar cual es el motivo , le quedaría muy agradecida. Just discovered the owl pattern, love it and worked up super easy! Thank you for sharing. I’m doing blankets and this is a special square going on my daughters blanket for Christmas. She adores owls! Even has an owl tattoo. It’s a really lovely design. Thank you for sharing it…. I just found this blog and would love to make this for my friend. However the pattern link says it was removed. Is there somewhere else I can go to get the pattern? I clicked on the link for the download but the page says that the pattern is no longer available. Is there another way I can download the pattern for easy reading? Thanks. that the pattern is no longer available. Is there another way I can download the pattern for easy reading? Thank you for making this cute pattern. I could not find the PDF so am wondering if you could email me a copy. [email protected]. I want to make this for my 13th great grandchild due in July. Thank you so much.